If there is anything that I love as much as beetles, it’s books! Pulling a handsome, leatherbound volume from its location on the shelf and smelling the aging paper while leafing through its pages quickens my pulse the way no electonic reprint ever can. That is not to say I don’t appreciate the convenience and increasing accessability of digital literature – especially with regards to searchability and the growing body of older, previously unobtainable works that can be downloaded and printed at will. Still, whenever I have a choice between pulling a real entomology journal from my shelf or accessing its electronic version on CD or online, I will opt for the real thing. Over the years, I’ve had the opportunity to obtain complete series of several journals key to my studies. The first, and most important of these, was The Coleopterists Bulletin. About 15 years ago I was able to purchase a nearly complete set of this journal previously owned by cicindelid icon Norman Rumpp. His set contained a few recent volumes overlapping with my own set, started in the early 1980’s, and dating back to all but the earliest of years. When I acquired the Rumpp set, I set about purchasing the missing volumes from the available stores of back issues still offered by The Coleopterists Society. However, a few of the earliest numbers were simply not available, so I borrowed copies of these from my good friend Gayle Nelson, carefully made 2-sided copies of each, and trimmed the papers to match the size of the originals. I then took the entire combined set of issues – Rumpp originals and Nelson photocopies – to the bindery and had them bound in antique burgundy, just as one would expect to see them in a university library. In the years since then, I have begun binding my other journal series as time and funds permit. Not only do these bound volumes look attractive, but they are eminently more functional – standing upright on their own and remaining nicely organized through heavy use. 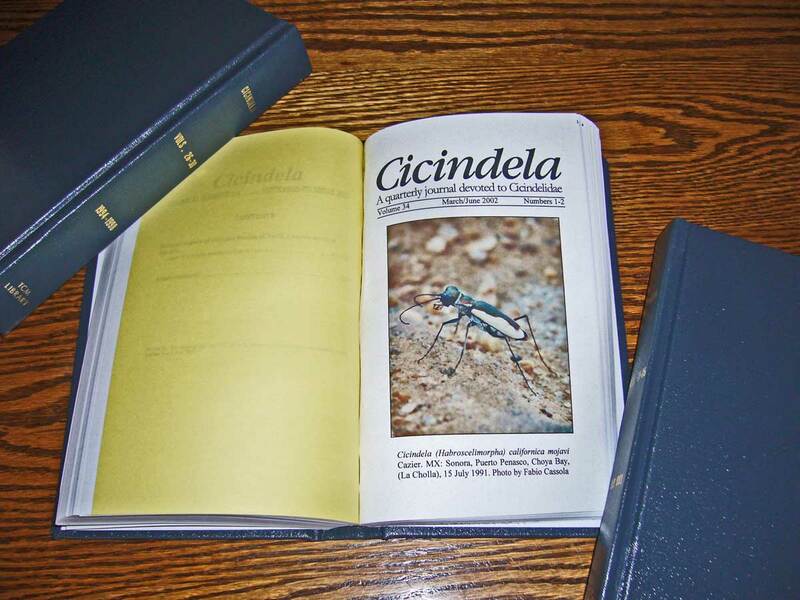 This week I placed my newest complete journal series on the bookshelf – the exclusively tiger beetle-focused journal, Cicindela. I’ve actually had the complete set for awhile now, purchased last year when editor Ron Huber had a limited number of complete sets reprinted. 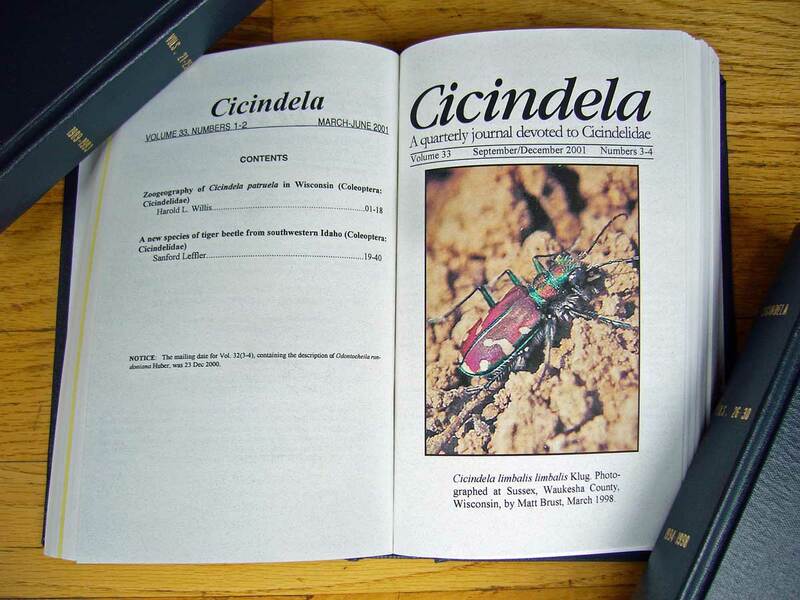 Being a more recent convert to tiger beetles, I hadn’t started my series of Cicindela until around 2000, although I did obtain some older volumes from the library of the late Prof. Wilbur R. Enns, kindly given to me upon his passing in 2003 by his close friend Prof. Ben Putler. Ron made all of the remaining volumes of this fine journal available to me to complete my set, and I’ve finally gotten the set bound – all 40 volumes dating back to 1969. While I was taking journal volumes to the bindery, I took advantage of the opportunity to bind a complete set of the SCARABS Newsletter. In keeping with the times, SCARABS is a completely virtual publication – all issues are created, distributed, and archived electronically, with the end user free to print a copy for themselves or not. I chose to print, again carefully generating 2-sided printed of each issue on a color laser printer, and had them bound in “volumes” of appropriate thickness. The example shown here is the “Frank T. Hovore” issue, produced as a memorial to one of our time’s most enthusiastic collector of beetles. Frank, known among scarab circles as “Mr. Pleocoma” for his dedication to rain beetles, died of a heart attack in 2006 while on a collecting trip to a remote part of Ecuador. 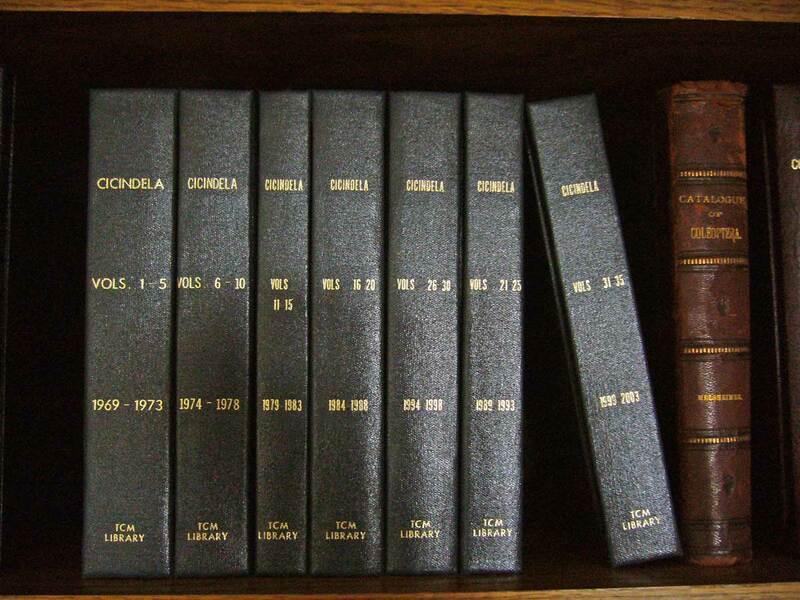 There is something ironically satisfying about having a complete, bound set of a modern, electronic periodical. Other complete sets that I have bound in my library include Insecta Mundi (vols. 1-18, subsequent volumes electronic only), Jewel Beetles (vols. 1-11), Consortium Coleopterorum (vols. 1-4), and Michigan/Great Lakes Entomologist (vols. 1-40). Also, while not complete, I have the last 21 volumes of The Pan-Pacific Entomologist, nicely bound in forest green. Oh, and look at the first photograph again – the book on the right side of the photo is an original copy of Catalogue of the described Coleoptera of the United States, published by Frederick Ernst Melsheimer in 1853. It is the oldest book in my library – received as a gift from the family of the late Marshall Magner, a long-time member of our local Webster Groves Nature Study Society, upon his passing in 2005. This entry was posted in [No taxon] and tagged beetles, entomologists, entomology, insects, literature, nature, science. Bookmark the permalink. 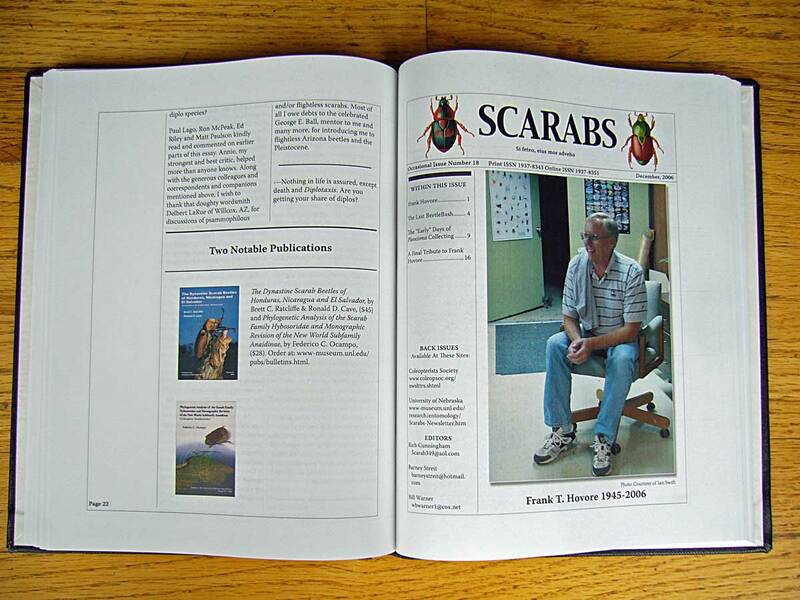 Ed Gage also published a very interesting journal on tiger beetles. A number of Dan Sumlin’s new taxa from Australia were described in it. Hi Chris – I wasn’t aware of this. Any idea where I can find copies of it? Excellent collection, Ted. I collect older books as well. There’s nothing in the world like the smell of old books. I mainly collect travel guidebooks but I have a few old insect field guides as well. My favorite is Lutz’s Fieldbook of Insects once owned by Minnesota entomologist Walter J Breckenridge. In writing about the entomologists from whom I’ve gotten some of my journals, it occurred to me that it might be fun to go through my library and compile all the various signatures and stamps of former owners of those books – especially the older ones. It could be interesting. The internet has made personal libraries obsolete in some ways, yet more important in others. I love the smell of old books!